Featuring: Christine Ayo, Annabelle Binnerts, Antonia Brown, Jake Caleb, Teddy Coste, Jānis Dzirnieks, Jakob Forster, Josje Hattink, Olga Hohmann, Lili Huston-Herterich, Peter Horneland, Honey Jones-Hughes, Jamie Kane, Merve Kiliçer, Matheline Marmy, Lucía Bayón Mendoza, Lukas Meßner, Josie Perry, Petter Dahlström Persson, Marco Rizzardi, Bobby Sayers, Yanik Soland, Daphne Simons, Berglind Erna Tryggvadóttir. And pedagogical team 2018-19: Liesbeth Bik, Kate Briggs, Bernd Krauß, Mike Sperlinger, Jan Verwoert, Nina Wakeford, Katarina Zdjelar, and Vivian Sky Rehberg (Course Director). The Master Fine Art at the Piet Zwart Institute is pleased to welcome you to its annual open studios, an occasion during Art Rotterdam week for visitors to experience the range of practices, realities, narratives, and dynamics the MFA program fosters in its studio “station” in the former St Willibrordusschool building dating from 1907, in Rotterdam’s city center. You will have the occasion to meet and engage directly with a new generation of emerging international artists as well as the core MFA teaching staff. While keeping our doors open to the public, the artists will be showing their work and hosting a durational program full of surprises, with the possibility of performances, screenings, readings, auctions, radio programs, guided tours, and conversations throughout the day. Program details will be announced on social media. 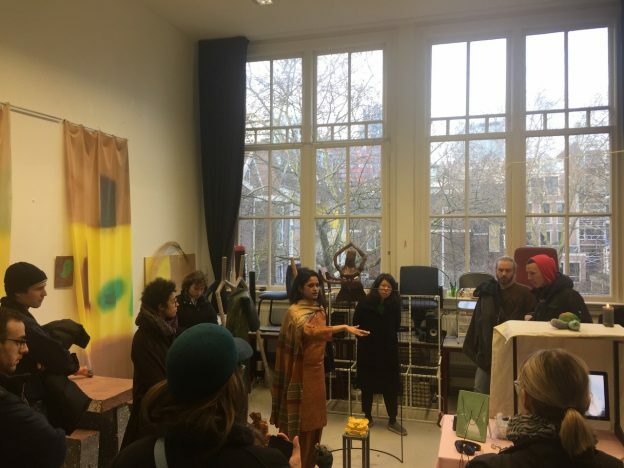 Open studios at Karel Doormanhof 45 coincides with the Piet Zwart Institute/Willem de Kooning Academy’s Open Day for prospective applicants at Blaak 10 and Wijhaven 61, where staff and students from all Master programs will be available to field questions. Please note the MFA building is located a short walk or bike-ride from the Willem de Kooning Academy, where MFA guests are encouraged to tour the state-of-the art technical facilities and learn about our academy as a whole. The two-year Master Fine Art program foregrounds the reciprocal articulation of self-directed research, practice, and professionalization. It considers critical reflection, debate, and action as integral to being an artist. The MFA guides artistic development through exposure to actors, influences, and ideas circulating in contemporary art, professional guidance and workshops, and exhibition and public program opportunities for presenting research and work to wider audiences. Due to the quantity of applications the Piet Zwart Institute Master programs receive, regulations regarding immigration, and international opportunities to apply for study funding, we strongly encourage you to apply early. March 1, 2019: Final deadline for non-EU applicants and priority deadline for EU applicants. May 1, 2019: Final deadline for EU applicants.